Trying to serve a vegetarian meal to my carnivorous family is no easy task, but every once in a while I can get away with it. And the best chance I have of getting away with it is to serve soup. And in between all those letters, they also ate their veggies. I was one happy mama! Preheat a 4-quart soup pot over medium heat. Saute onion and celery in the oil with a pinch of salt until soft. Add garlic and cook until fragrant, 30 seconds or so. Add carrots, potatoes, thyme, tarragon, vegetable broth and salt. Cover and bring to a boil. Once boiling, lower heat to a simmer, add pasta and cook until pasta and vegetables are soft, about 10 more minutes. Add sugar, tomato sauce and frozen peas and heat through (5 minutes or so.) Remove from heat. It tastes better the longer you let it sit, but give it at least 10 minutes. Taste for salt and seasoning, and serve. 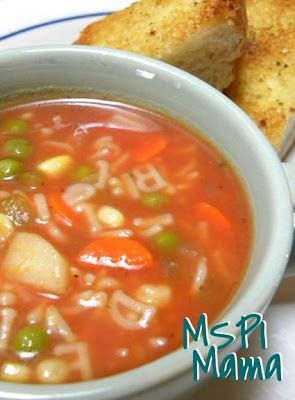 Tip: This soup is a great way to use up the odds and ends of frozen vegetables you may have lurking in your freezer. Feel free to toss in corn -- if you look hard, you'll see there's some in my picture of the soup -- or green beans, etc. Where did you find the alphabet noodles? I am from Omaha too, but cannot find them anywhere. I think I got them at Walmart, but I'm not positive. I can't remember for sure. Sorry!